Eva Calandar needs to run. Again. Her ex-boyfriend, a black magic practitioner, has tracked her down. Again. But she might be the key to rescuing a group of girls from becoming human sacrifices, and there’s a certain astonishingly hot Atlantean warrior with a fierce protective instinct who is making her think longing thoughts of finally making a stand. Together, they’re so much stronger than they were apart, but the heat between them may be enough to burn down the world. Flynn left Atlantis a long time ago but decided to return just as Denal was out to find warriors for his newly formed team. He's sent out on his first mission and can't understand why he's so attracted to Eva. Eva is on the run from her biker gang member ex-boyfriend. He's abusive and doesn't care about her but just won't let her go. She's just about to run again when she meets Flynn and he asks for her help in rescuing some girls that the biker gang has kidnapped. The biker gang is no usual biker gang and that realization along with what is about to become of the kidnapped girls is what sparks Eva into action to help even though she thinks it might cost her, her life. There was quite a bit of action and I thought the whole story line abut the biker gang, the kidnapped girls and Eva was a lot of fun to read. Eva and Flynn make such a great couple, they were so good together. She's a lot stronger than she thinks she is and he has a big heart. There's more to Eva than just having a gift with animals and that twist comes towards the end of the book. I felt bad for everything Eva had given up while she was on the run, especially since there was a sweet dog she had become attached to but didn't think she could give Daisy a home. It was so sweet to see them together. I really liked Flynn together and getting to know some of the other people of Atlantis. Some of the secondary characters are great and I look forward to seeing them again. I've been reading this authors books for a long time and I've always liked them. 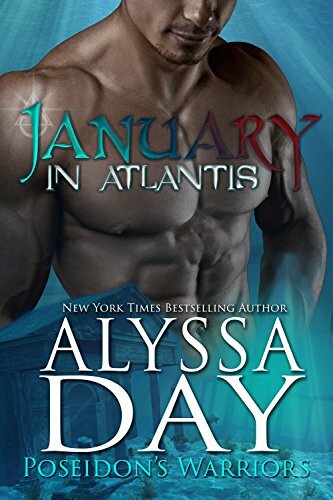 I love the whole Atlantis theme in these books and the male characters always seem to be so alpha, and if you've read any of them you know what I mean.